What Is Breccia, How Does It Form, and What Is Its Composition? 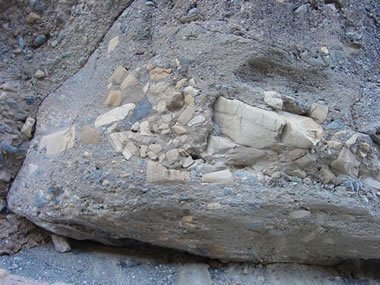 Debris Flow Breccia: Outcrop of a breccia thought to have formed from debris flow deposits in Death Valley National Park. The largest clasts are about three feet (one meter) across and are thought to be from the Noonday Dolomite. United States Geological Survey image. Breccia forms where broken, angular fragments of rock or mineral debris accumulate. One of the most common locations for breccia formation is at the base of an outcrop where mechanical weathering debris accumulates. Another is in stream deposits a short distance from the outcrop or on an alluvial fan. Some breccias form from debris flow deposits. The angular particle shape reveals that they have not been transported very far (transport wears the sharp points and edges of angular particles into rounded shapes). After deposition, the fragments are bound together by a mineral cement or by a matrix of smaller particles that fills the spaces between the fragments. In arid and semiarid areas, the precipitation of mineral cements in shallow sediments or soils can result in the formation of extensive rock units known as "caliche." These materials often have the appearance of breccia and fit the definition. Limestone Breccia: A breccia that contains clasts of multiple types of limestone. Specimen is about four inches (ten centimeters) across. How Does Breccia Differ From Conglomerate? Breccia and conglomerate are very similar rocks. They are both clastic sedimentary rocks composed of particles larger than two millimeters in diameter. The difference is in the shape of the large particles. In breccia the large particles are angular in shape, but in conglomerate the particles are rounded. The particle shape reveals a difference in how far the particles were transported. Near the outcrop where the fragments were produced by mechanical weathering, the shape is angular. However, during transport by water away from the outcrop, the sharp points and edges of those angular fragments are abraded and rounded. The rounded particles would form a conglomerate. Talus Slopes: Scene of a mountain environment where talus, the angular mechanical weathering debris that might form breccia, is produced in abundance. Panorama from Kearsarge Pass looking east over Big Pothole Lake into the Owens Valley. Image copyright iStockphoto / Tom Grundy. Breccia has many compositions. Its composition is mainly determined by the rock and mineral material that the angular fragments were produced from. The climate of the source area can also influence composition. Most breccias are a mix of rock fragments and mineral grains. The type of rock that the fragments were produced from is often used as an adjective when referring to the rock. Some examples: sandstone breccia, limestone breccia, granite breccia, chert breccia, basalt breccia, and others. Often a breccia will contain many types of angular rock fragments. These are known as polymict breccias or polymictic breccias. Breccia can be any color. The color of the matrix or cement along with the color of the angular rock fragments determine its color. 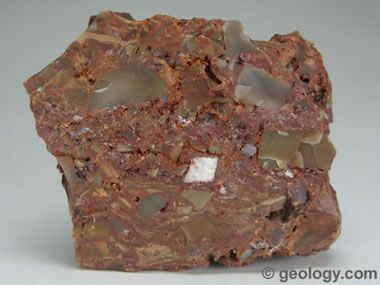 Breccia can be a colorful rock, as shown in the photos on this page. 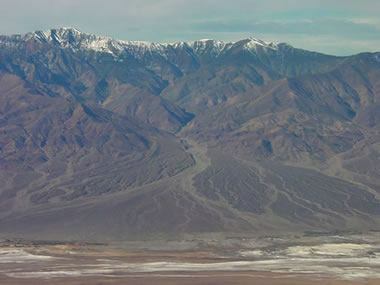 Alluvial Fan: An alluvial fan in Death Valley National Park. Material on the fan was weathered from the mountains in the background and transported a very short distance. United States Geological Survey image. Impact Breccia: A 457.7-gram breccia specimen from the Popigai impact crater in northern Siberia. Note the variety of colors, sizes, shapes, and textures within a single mass - the result of a major meteorite impact which threw millions of tons of rock into the air. As fragments fell back to Earth, rocks from different strata were mixed together. Photograph by Geoffrey Notkin, copyright Aerolite Meteorites. Is the Word "Breccia" Used in Other Ways? Geologists have been very generous in their use of the word "breccia." 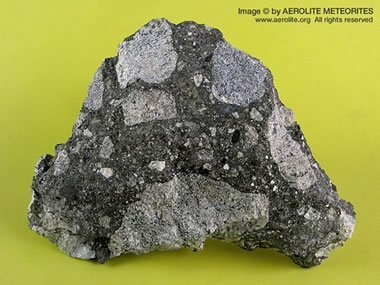 It is common to hear the term used when referring to a rock or rock debris made up of angular fragments. 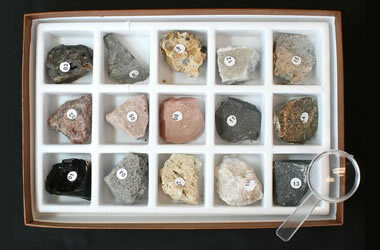 Although it is mainly used for rocks of sedimentary origin, it can be used for other types of rocks. A few more uses of the word are given below. Collapse Breccia: Broken rock that originates from a cavern or magma chamber collapse. Fault Breccia or Tectonic Breccia: Broken rock found in the contact area between two fault blocks and produced by movement of the fault. Flow Breccia: A lava texture produced when the crust of a lava flow is broken and jumbled during movement. Fold Breccia: A breccia formed by the folding and breakage of thin, brittle rock layers which are interlayered with incompetent, ductile layers. 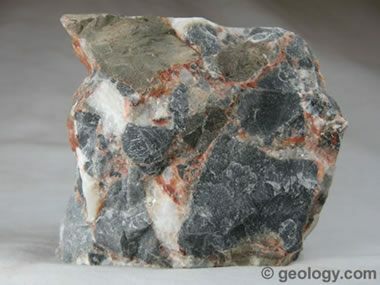 Igneous Breccia or Volcanic Breccia: A term used for a rock composed of angular fragments of igneous rocks. "Flow breccia" and "pyroclastic breccia" could be called "igneous breccia." Impact Breccia: A deposit of angular rock debris produced by the impact of an asteroid or other cosmic body. See an article about "impactites." Monomict Breccia: A breccia whose clasts are composed of a single rock type, possibly all from a single rock unit. Polymict Breccia: A breccia whose clasts are composed of many different rock types. Pyroclastic Breccia: A term used for a deposit of igneous rock debris that was ejected by a volcanic blast or pyroclastic flow. When you hear the word "breccia" used in reference to a rock or rock material, it is fairly safe to assume that it means angular-shaped pieces. Breccia as an Architectural Stone: Sometimes breccia has an interesting or attractive appearance that makes it suitable for use as an architectural stone. It might be cut into slabs and used as a facing stone, stair treads, floor or wall tiles, window sills, or countertops. 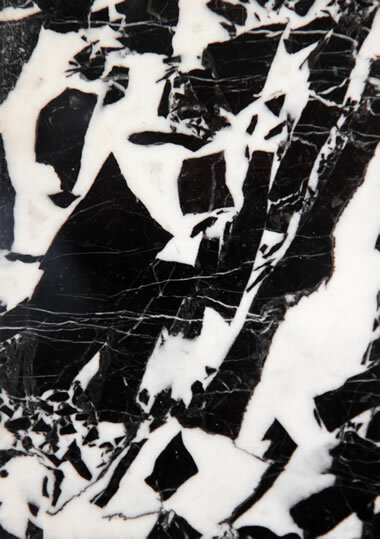 This photo shows a portion of a large slab of brecciated marble, mined in France, that will be used as an architectural stone. Image copyright iStockphoto / Violetastock. Breccia as a Gemstone: Attractive and interesting pieces of breccia are sometimes suitable for use as a gem material. 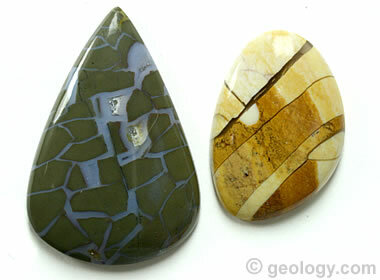 Shown are two cabochons cut from pieces of breccia. The teardrop-shaped stone is a highly fractured green jasper that was cemented by milky chalcedony. The freeform cabochon is a piece of tan mookaite that shows multiple fractures with displacement. The jasper cab measures 42 mm high by 29 mm wide; the mookaite cabochon measures 32 mm high by 22 mm wide. What are the Uses of Breccia? The rock, breccia, has very few uses. It can be used as fill or road base where the technical requirements are minimal. It is rarely used in important projects because its composition, degree of cementation and competence are highly variable. The word "breccia" is used as a trade name for a group of dimension stone products with a broken, angular pattern. Names such as "Breccia Oniciata," "Breccia Pernice," and "Breccia Damascata" are cut and polished limestones and marbles that reveal a broken, angular pattern. These breccias are used as architectural stones for interior building veneers, tiles, window sills, and other decorative applications. These are proprietary names applied to the rock from specific quarries.